Sensors using semiconductor nanowire detection elements: These sensors are capable of detecting a range of chemical vapors. When molecules bond to nanowires made from semiconducting materials such as zinc oxide, the conductance of the wire changes. The amount that the conductance changes and in which direction depends on the molecule bonded to the nanowire. For example, nitrogen dioxide gas reduces how much current the wire conducts, and carbon monoxide increases the conductivity. Researchers can calibrate a sensor to determine which chemical is present in the air by measuring how the current changes when a voltage is applied across the nanowire. Semiconducting carbon nanotubes: To detect chemical vapors, you can first functionalize carbon nanotubes by bonding them with molecules of a metal, such as gold. Molecules of chemicals then bond to the metal, changing the conductance of the carbon nanotube. As with semiconducting nanowires, the amount that the conductance and its direction changes depends on the molecule that bonds to the nanotube. This type of sensor is now commercially available. Carbon nanotubes and nanowires that detect bacteria or viruses: These materials can be used also to sense bacteria or viruses. First you functionalize the carbon nanotubes by attaching an antibody to them. When the matching bacteria or virus bonds to an antibody, the conductance of the nanotube changes. In this process you attach nanotubes to metal contacts in the detector and apply a voltage across the nanotube. When a bacteria or virus bonds to the nanotube, the current changes and generates a detection signal. Researchers believe that this method should provide a fast way to detect bacteria and viruses. One promising application of this technique is checking for bacteria in hospitals. If hospital personnel can spot contaminating bacteria, they may be able to reduce the number of patients who develop complications such as staph infections. 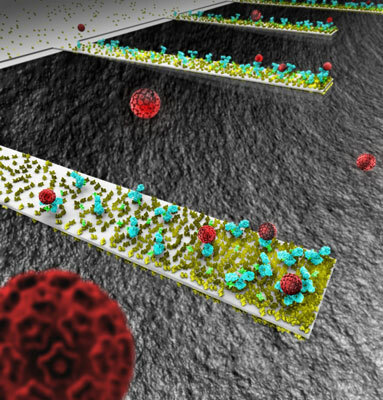 Nanocantilevers: These devices are being used to develop sensors that can detect single molecules. These sensors take advantage of the fact that the nanocantilever oscillates at a resonance frequency that changes if a molecule lands on the cantilever, changing its weight. Coating a cantilever with molecules, such as antibodies, that bond to a particular bacteria or virus determines what bacteria or virus will bond to the cantilever. One example of nanoparticles used in sensors is a hydrogen sensor that contains a layer of closely spaced palladium nanoparticles that are formed by a beading action similar to water collecting on a windshield. When hydrogen is absorbed, the palladium nanoparticles swell, which causes shorts between nanoparticles and lowers the resistance of the palladium. Another use of nanoparticles is in the detection of volatile organic compounds (VOCs). Researchers have found that by embedding metal nanoparticles made of substances such as gold in a polymer film, you create a VOC nanosensor. Sensors are also being developed to detect molecules that indicate that a particular disease is present in a blood sample.